Exceptional value joins quality with this popular 19 Sport. S/S hardware, non-skid flooring and battery on-off switch go one up on the rivals. Storage is abundant and there is a cooler under the back seat. High quality sound system includes both the USB and MP3 jacks. 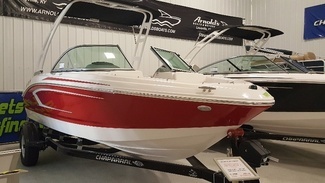 Also included in this 19 Sport is the Deluxe Package, snap in carpet, a folding Velocity arch with bimini and the 4.5 200 HP engine.